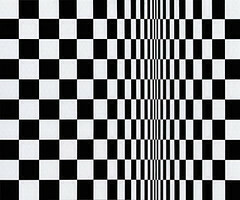 Op art, also known as optical art, is a style art that makes use of optical illusions. Op art works are abstract, with many of the better known pieces made in only black and white. When the viewer looks at them, the impression is given of movement, hidden images, flashing and vibration, patterns, or alternatively, of swelling or warping. Bridget Riley was one of the first famous op artists. Her black and white works of the early 1960s were said to induce sensations in viewers as varied as seasickness and sky diving.